(Toronto, Ont.) The USA and Turkey ended the Toronto Challenge with wins against Great Britain and Canada in the final games of men’s wheelchair basketball on Tuesdays at the Mattamy Athletic Centre. Playing for bronze, Turkey faced Canada in the opening game of the night. Turkey managed to build up a 16 point lead by half time and although the Canadians picked up the pace in the final two quarters they were unable to catch Turkey, admitting a 75-68 defeat. Ozgul Gurbulak of Turkey led all players with 27 points, while Nik Goncin paced the Canadian offence with 19 points. The United States remained undefeated to take gold against Great Britain in the final match of the tournament. The Americans claimed the win 59-48 against the Brits. Josh Turek secured 11 points for the USA while Gaz Chiudry matched him with 11 points for Great Britain. 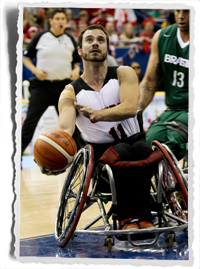 The Toronto Challenge marks the first major test for the Canadian men after being nominated to represent the maple leaf at the Rio 2016 Paralympic Games, where Canada aims to defend its first place finish from the London 2012 Paralympic Games.